Gynaecologists' Advice on "How to Maintain Healthy Pregnancy?" Home pregnancy What Kind Of Questions Is A Doctor Bombard With, Regarding Miscarriage? 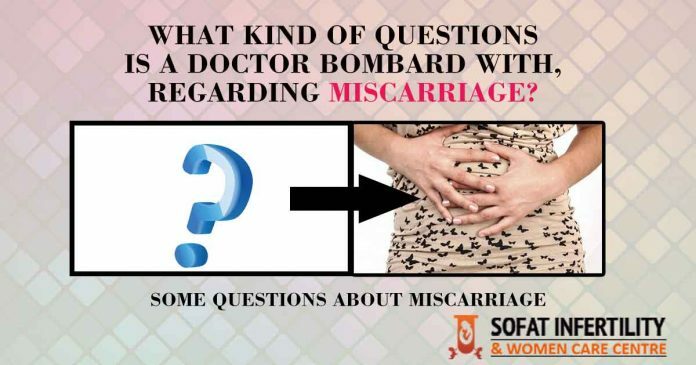 What Kind Of Questions Is A Doctor Bombard With, Regarding Miscarriage? Going through a miscarriage can be quite depressing for a couple. Miscarriages have become very common these days, many pregnancies end up in the 20th week itself. Couples going through a miscarriage, it’s quite important to know that they are not the only ones, going through this traumatic thing. It is also important to know that just as we have other days (Twins day, which I mentioned in one of my earlier posts, friendship day, and many more) so is a day dedicated to the lost little ones also celebrated( called Pregnancy Loss Remembrance Day), which is on the 15th October. It is all about making people aware about miscarriage and also helps to minimize the dishonor, associated with it. The emotional trauma is surely there for any couple who has/is going through this devasting thing, but besides this, another reason for getting frustrated is the enormous questions they are asked. Even if you have had a miscarriage, once, next time you can have a healthy pregnancy. How will the lady come to know of having a miscarriage? They can come in any way, someone may have pain like the one in menses along with bleeding. For some, there might not be any symptoms but during a routine check-up with ultrasound going on. Ultrasound can pick up many things, which even the doctors in check-ups, cannot come to know. One of my relatives has had been through a miscarriage, does that mean even I have the chances of the same? Miscarriages are quite common; it’s not surprising that other family members may have gone through it. Many cases of miscarriages are seen/heard. Some can run in the family, that too because of being coincidental. What causes miscarriages to happen? Mostly the miscarriages happen because of abnormal embryos. Other things being – Endocrine disorders, blood clotting disorders, structural abnormalities during conception, hormonal problems, blood clotting disorders. Can a couples age increase the chances of miscarriage? Since we all know that a woman is born with a large number of eggs and these eggs also experience aging, the way we all do. Women, who are above 35 years of age go through an increased chance of miscarriage because the quality of eggs also goes down. Till the time a woman is around 43 years of age, there is around 50% chance that she might have to suffer from miscarriage.